Children are playing in front of the Shimane Prefectural Office (島根県庁) in Matsue, Shimane Prefecture, ca. 1880s. 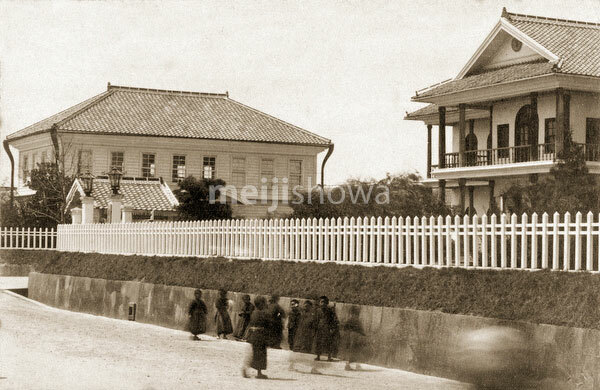 The two story Western-style building was built in 1879 (Meiji 12). From around 1907 (Meiji 40) it was used as Shimane’s Commercial Museum (島根縣物産陳列所), promoting local products. The Matsue Chamber of Commerce and Industry at that time also located here. The museum was closed in 1940 (Showa 15). Currently, the Kenmin Kaikan (県民会館) stands around here.